As a founding member of the Moda collective, Tom Staar has played a huge part in creating possibly one of the UK’s most exciting new music brands, alongside Jaymo & Andy George. Now, he gets set for further success as he releases his latest track, ‘Faces’, which is out now on Wolfgang Gartner’s Kindergarten Recordings. Whether throwing 2000 capacity warehouse raves or intimate basement parties, signing bands like Fenech Soler and Monarchy or working on their own musical projects – Moda is all about taking some of the freshest electronic music to all corners of the planet, via any means possible. 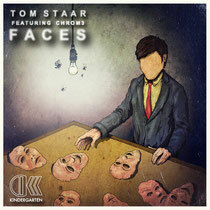 ‘Faces’ has been a highlight of Wolfgang Gartner and Tom Staar’s recent sets and always seems to get a good crowd reaction. Featuring the vocals of Chrom3, you can check it out below.